Chatham Property Maintenance located in Savannah, Georgia offers both residential and commercial professional sprinkler/irrigation system services for maintenance, repairs, and installations. We not only offer sprinkler system installations we also offer a large variety of other landscaping services. 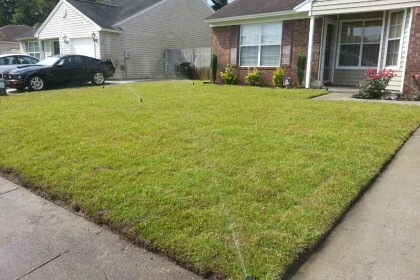 From minor sprinkler system repairs to major irrigation system installation and renovation, Chatham Property Maintenance provides Savannah, Georgia the irrigation expertise and services necessary for optimum lawn care. Each landscape is unique. Our skilled technicians assess your landscape’s needs and by providing regular sprinkler system maintenance we help to sustain and promote healthy growth and maximize water conservation. Using only high-quality products from recognized and reliable brands like Hunter, Rainbird, and Toro, Chatham Property Maintenance Irrigation provides worry-free irrigation services. If you are looking for professional sprinkler/irrigation system repairs you have come to the right place. Like everything, your irrigation system will eventually need repairs. We provide all types of repairs from busted pipe repairs to electronics/control box diagnosis. There’s a common problem with the design of many installed sprinkler systems. Your plants continually grow, but your sprinkler system remains stationary. 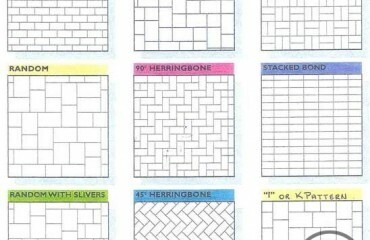 Over time, your watering becomes less efficient. Water coverage is blocked by the growing plant material. Not only does your landscape suffer, but you waste water. 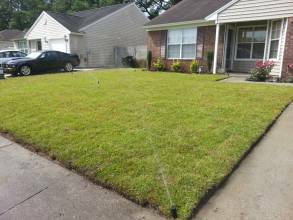 Chatham Property Maintenance irrigation services will completely upgrade your system or provide needed sprinkler repair, to accommodate current and future growth of your healthy landscape. A new sprinkler system design will incorporate optimal watering into your new or changed landscape design. Your landscape will benefit from proper irrigation, you’ll help Georgia water conservation efforts and you’ll lower your water bill by installing modern, efficient sprinklers. At Chatham Property Maintenance when your Irrigation system is installed, water management and landscape development themes are incorporated simultaneously. When it comes to installing irrigation systems, Chatham Property Maintenance comes with an extensive knowledge of local plant material and your watering needs. Your sprinkler system is designed to sustain current, immature plants while envisioning the most efficient means of nurturing future growth. Savannah’s Irrigation Services custom designs your irrigation system from the ground up, because installing irrigation requires a unique blend of your current and future growth needs. For irrigation/sprinkler systems repairs and installations we use rain bird irrigation products or hunter irrigation products. For installation, we use either 3/4″ or 1″ schedule 80 PVC pipe, the size of the pipe is decided by your current water pressure. 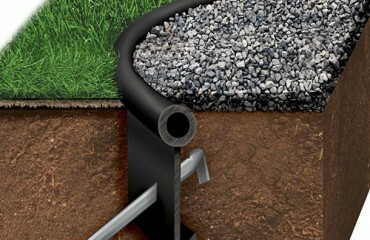 Pipes or at least 1′ below ground level, this helps prevent freezing and damage.